I finished the quilt that I was making to be auctioned off, making it the first quilt that I’ve made since we moved to Maryland. Sewing it together went pretty quickly once all of the squares were made. Because of the construction of the squares, the fabric is cut on the bias which I found could stretch them out a bit. There was only one section that I had a bit of trouble with, but luckily I was able to get it to lie flat when I was pinning it. As for the quilting, I went with a grid pattern and stitched ∼1/4 inch on either side of the seams, making a grid pattern. 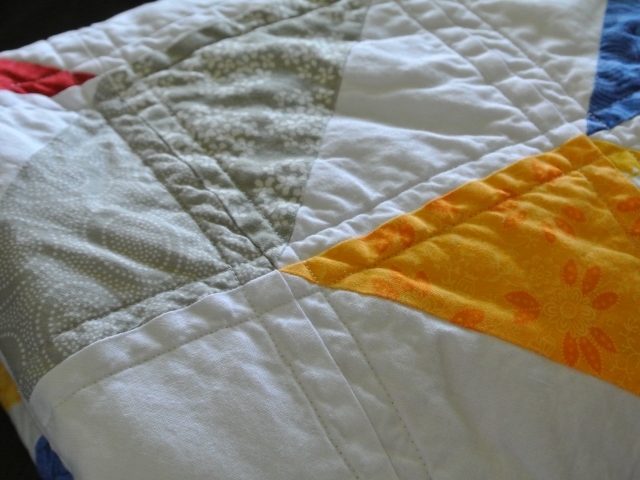 I was afraid that if I followed the triangles, it would highlight a chevron pattern instead of a herringbone. It was also a nice bonus that it took almost no time to quilt with a walking foot. I used Warm and Natural Needled Cotton Batting, which is my favorite batting. 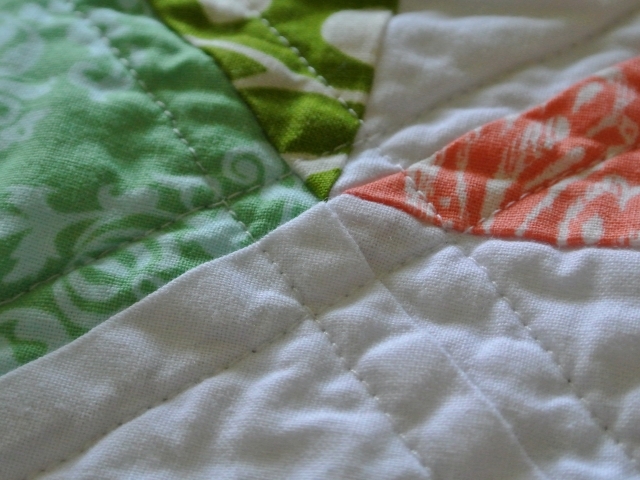 It is dense and creates a warm, but light quilt. I also have never had any issues with it shifting around after multiple washes. For the backing, I went with a gray with a hint of green. I wanted something neutral that complemented all of the colors on the front. I debated the binding for a while, but ultimately went with a cobalt blue. I went with a slightly larger binding than I normally do, so it ended up being 1/2″ instead of 3/8″. 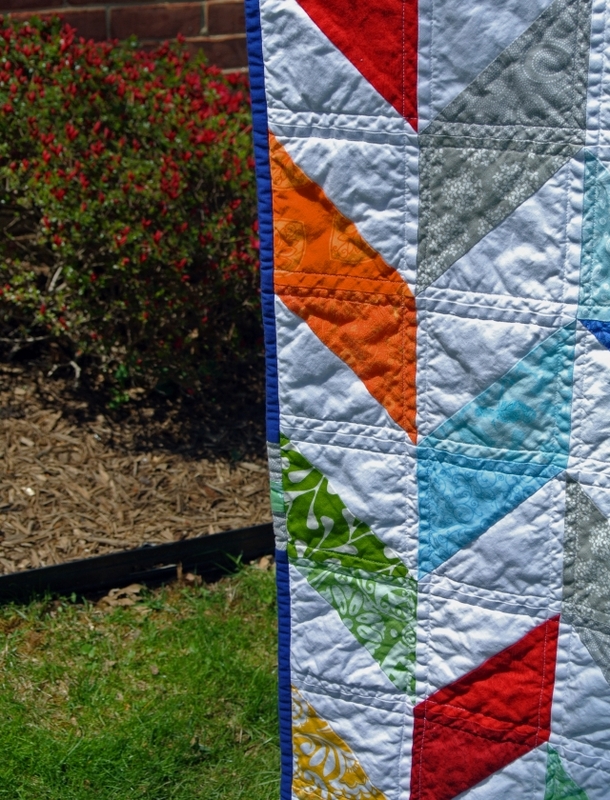 I think that it gives the quilt a nice framing. Again I didn’t want anything that clashed with the front. I washed the quilt before I mailed it out to make sure that there were no issues, which thankfully there weren’t. 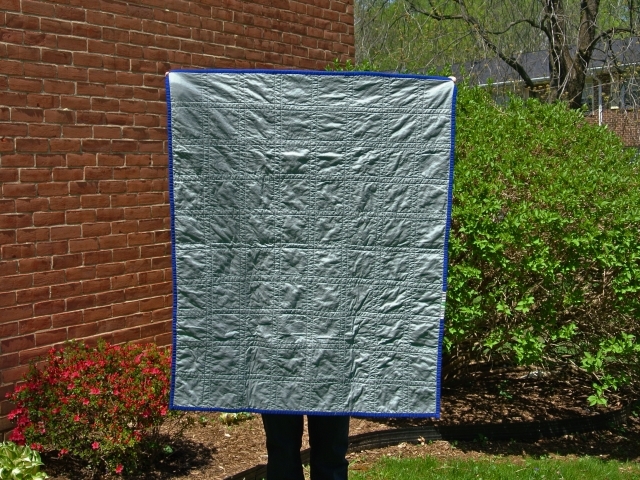 After washing, the quilt’s final dimensions were 37″ by 45″. 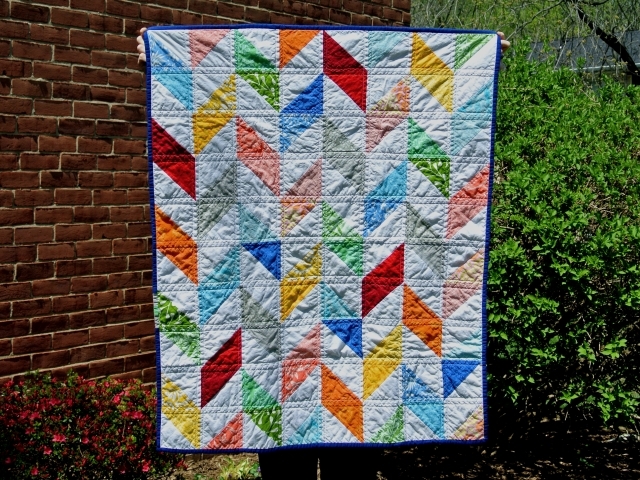 This entry was posted in crafty, quilting, sewing and tagged fabric, Quilt, quilting, Sewing. Your great-grandmothers Kressley and Schutter would be very proud of their great-granddaughter, What a great auction item!